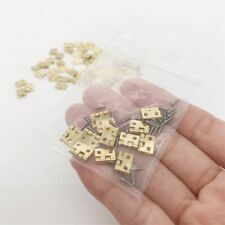 Lead flashing for dolls houses 2" x 12"
12 x Mini Hinges. Material: Alloy. Dollhouse Miniature Lion Head Door Knocker 1:12 Scale Tiny 11/16" high x 9/16"
Perfect finishing touch for your 1:12 dollhouse door! 5 out of 5 stars - Dollhouse Miniature Lion Head Door Knocker 1:12 Scale Tiny 11/16" high x 9/16"
4 product ratings4 product ratings - Dollhouse Miniature Lion Head Door Knocker 1:12 Scale Tiny 11/16" high x 9/16"
Perfect detail to add to your sink. Resin corbels that can be left as is or painted. 1 1/8" tall x 1/2" wide x 5/8" deep across the square top. Dollhouse Miniature Large Cast Resin Ceiling Rose Medallion 1:12 Scale 2 7/8"
Dollhouse Miniature Window or Door Balcony Half Round Unfinished 1:12 Scale 3"
Laser cut wood balcony, assembled but not painted. Fits a 2 1/2" opening. 1:12 Scale. This is sized for a dollhouse. Drill a small hole to insert knob in desired location. Attach with glue. Dollhouse Miniature Small Wood Finial Architectural Ornament 12 Pieces 1:12 3/8"
Tiny crystal door knobs or drawer pulls (would be large drawer pulls). So many different uses for these, ready for you to paint or stain to match any decor. Plaster wall panels, finish with paint or clear sealer. Create your own sink using this ceramic basin, perfect for bathroom or kitchen. 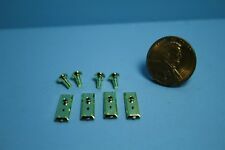 Little spindles for 1:24 scale stairs or porches. Perfect finishing touch in your dollhouse. Completes 4 windows with locks. Window Hardware. 1:12 Scale. This is sized for a dollhouse. Detailed scale model for adult collectors. Not intended for children under 14. 1in to 1ft. 1:12 Scale. This is sized for a dollhouse. Includes both pieces to create one slot. 1in to 1ft. 1:12 Scale. This is sized for a dollhouse. To install: drill a small hole to insert knob in desired location. Attach with glue (not included). Plaster wall panel, finish with paint or clear sealer. This miniature strip of White Picket Fence is perfect for dollhouse crafts, models and other projects. The 2" height is perfect for a variety of dollhouse scales depending upon how high you wish the fence to appear (For example, in 1/12 scale this would be the equivalent of a 2' fence). Large corbels for a grand room! The corbels are made from a poly resin material that can be left as is or painted. 2 5/8" tall x 1" wide x 5/8" deep (6.8 cm x 2.5 cm x 1.7 cm). Stanley Miniature Drapery Rod wi Brackets #1786 Clare-Bell Brass 8"
Carlson Dollhouse Miniature Window Double Hung Working 5 1/16" x 2 9/16"